A newspaper-style RSS reader for the iPad has been updated with new abilities to import blog feeds and save long articles for later reading. Acrylic Times for iPad combines news feeds into a single page, letting users quickly scan through headlines and photos to pick the articles they find most interesting. Version 1.1 of the app, launched on Friday, now allows users to import their Google Reader RSS feeds, eliminating the need to manually add each source. 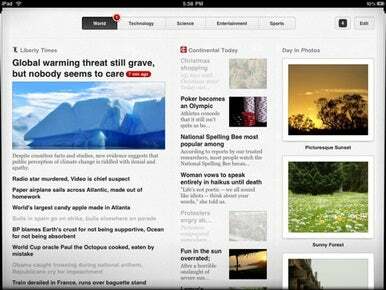 The updated app also includes a tool to let users save articles to Instapaper or Read it Later for future perusal. The app from Acrylic Software was also updated with the ability to view articles directly in the iPad’s Safari browser; previously, readers were required to view Web versions of articles in Acrylic Times’s in-app browser. The app’s portrait mode has also been designed for easier viewing and reading. Acrylic Times for iPad is $8, and works on iPads running iOS 3.2 or later.